Using Captain Cook’s first points of contact as a reference and a Roadcraft BaseJumper OCV (Overland Camping Vehicle) as his stead, Jason Burgess set the controls for the farthest eastern edges of the lower North Island. Along the way he discovered wide open-country and hardy souls along epic beaches where he retired each night within earshot of a shore break. “You must see! You must see!” chant the excited family of Thai tourists who wave us down on the rocky road to Cape Palliser. “Seals there, many, very beautiful. You must see!” On a coast so raw, Maui could have just lifted it – wind stunted manuka, dwarf flax and all – straight from the sea, our encounter with a mini bus full of eastern explorers on tour in an unseasonable storm, is surreal. Up the coast, the iconic Castlepoint lighthouse sits on the shoulders of a monkey-face promontory, jutting deep into the Pacific about where Cook traded with waka offshore, as he had at Palliser. A loop track around the point proffers wide views across the arcing bay, reef and Deliverance Cove. Normally a surfer’s paradise and an angler’s heaven, oceanside the sea boils, and salt spray flails the rocks on the back of a force ten blow. Cook dedicated the names of his home-country landmarks, Lords and Admirals onto a coastline already better tagged with handles representing the landscape. 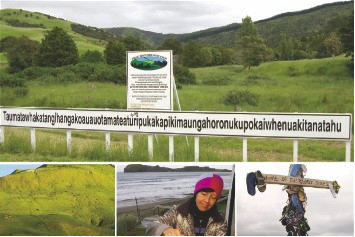 In this case the Maori name, Rangiwhakaoma, “the place to stand to see the running sky,” is apt. “Herbertville?” says Hugh at the Seaview campground, “even people in Dannevirke and Waipak’ don’t know where we are and we’re only an hour from there.” While Kiwi’s might not be aware of its whereabouts, “European cyclists,” says Hugh’s wife Pam, “have no problems at all finding it.” The names Joseph and Sarah Herbert probably won’t mean much to many, but to the community formerly known as Wainui, these early settlers left their name. Big water is an apposite moniker for this 11km stretch of wild sands, which sit capped by the headland Cook dubbed, Cape Turnagain. Taumatawhakatangihangakoauauotamateaturipukakapikimau ngahoronukupo-kaiwhenuakitanatahu near Orangahau, is little more than a road sign and a distant hill, but as the world’s longest placename in an English speaking country it draws a steady pilgrimage of international visitors down SH52 for been-there done-that photos. (The summit where Tamatea, the man with the big knees, the climber of mountains, the land-swallower who travelled about, played his nose flute to his loved one). It’s a bit of a culture shock heaving to for a coffee in Havelock North. The public toilet greets me before playing a Richard Claydermanish version of “What the World Needs Now.“ The shop assistants all speak with grapes in their mouths and the Info centre pushes vineyard visits over everything else. I catch sight of my gone-troppo-self in boutique windows – I’m about as mismatched in this town of long-lunching ladies as one of Cook’s crew would be. Following Cook, lead we head to higher ground. At the stunning Te Mata Peak track, a kaumatua’s karakia welcomes a group of tourists and stops us dead on the ridgeline. With neck-hairs bristling we get an insight into the chronicles of legend regarding the Sleeping Giant that rests within this sacred range. The ‘Devil’s Elbow’ on SH2 is a prelude to the challenging but beautiful drive between Napier and Wairoa, skirting Lake Tutira and wending through the gorges of the Mohaka River. Blue skies are now shining on me. As we hit the Mahia Peninsular, the shoulder of the Nuhaka-Opoutama coast road gives way to the sheer chalky cliffs dwarfing three surfers feasting on a banquet of perfect peaks. Kahawhai St, Pipi Cres and Moana Drive sum up the coastal vibe of Mahia Beach. And, as luck would have it, Wellington reggae band Hikoikoi kick off at the aptly named Sunset pub, easing us into the spirit of the peninsula. Cook renamed Waikawa Island, off the end of Mahia, Portland. The island can be seen from high on Kirikiri Road. Before Europeans the island – once visited by the sacred waka Takitimu – was a Whare Wananga (school of learning.) Cook never landed here. He was met by warriors brandishing arms, and the distraction saw the Endeavour narrowly miss running aground. Further around the coast road is Bishop Williams’ baptismal font, a basin within a stone at Whangawehi, where Maori were first baptised in 1842. An industrial zone marks the spot where in 1769 two worlds collided on the west side of Turanganui River in present day Gisborne. Cook’s effigy stands on the east bank near the statue of Young Nick, who still points from an imaginary crow’s nest to the white cliffs of Te Kuri o Paoa, a sighting that not only earned him two kegs of rum, but naming rights in-perpetuity. From the 660m long Tolaga Bay wharf north, we allow a couple of days of ducking and diving into bays like Anaura, the second landing site for the crew of the Endeavour, and their first friendly Aotearoan welcome. Even then time gets away on us along the timeless SH35. Like surveyors in a foreign land, we round the 20 odd kilometres of gravel road from Te Araroa towards East Cape, where reefs meet stony beaches before sweeping up into steep hillsides. It feels like Hawaii. Seven hundred and fifty steps ascend the Cape’s hump, and from here only East Island and a distant fleet of fishing boats spoil the horizon’s bend to South America.